At the Lux Golden Rose Award was all about glamour, style and grace. Check out your favorite stars dazzling on the red carpet. After Ranveer Singh and Deepika Padukone’s destination wedding, the next big thing taking the social media by storm is the third edition of Lux Golden Rose Awards. All the top Bollywood stars put their stylish foot forward on the red carpet of the event. Stars joined hands to applaud the women achievers of Bollywood as an extension to United Nation’s #HeForShe campaign. While Shah Rukh Khan, Akshay Kumar and Varun Dhawan showed us how to suit up, Bollywood Divas like Alia Bhatt, Kareena Kapoor and Janhvi Kapoor also oozed panache at the event. Yesteryear’s stars like Zeenat Aman, Rekha, and Helen were also seen looking graceful on the red carpet. We picked the best-dressed celebrities from the star-studded event who just set fashion goals way too high. Janhvi choose to wear an ivory bridal gown by Reem Acra from the Fall 2018 Bridal Collection. 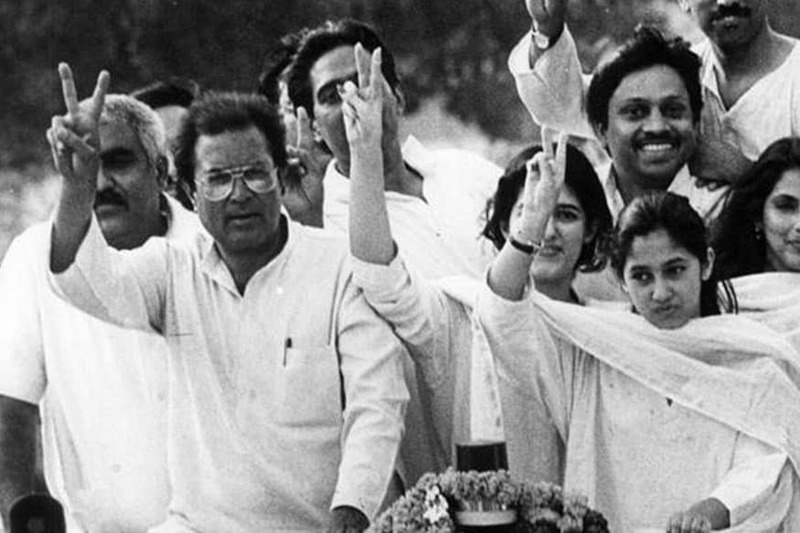 She looked nothing less than a new-age bride in her ivory embroidered gown with noodle strap. The trendsetter is back again, this time making heads turn in her Prabal Gurung dual tone gown from his spring 2018 Collection. Red and pink, an unusual combination with high slits, enhanced her features. Yet another bridal look on the red carpet, Alia Bhatt wore a strapless gown silver metallic gown by Netta Ben Shabu and looked flawless with her soft curl hairdo. In Maison Yeya’s ice blue gown and diamond necklace, Jacqueline carried the low hem gown with utmost grace. In her red sequined gown by Atelier Zuhra, Aishwarya proved that she can flaunt the scarlet look better than anybody else. Her red tinted lips matched the mirror and sequined full sleeve red gown. We did not see this coming, Madhuri in neon! Madhuri flaunted Swapnil Shinde’s neon pink gown with cape sleeves which was plain but clearly as graceful as her. King Khan made a star studded entry on the red carpet in his navy blue suit and black shoes. The Khiladi flaunted this unusual three piece suit with a golden brooch and we absolutely loved this avatar. In an all black tuxedo by Boss and shoes by Todds, Kartik looked dapper on the red carpet. In a Roberto Cavalli suit, Varun Dhawan flaunts his geeky look along with his Fossil watch and shoes by Christian Louboutin. 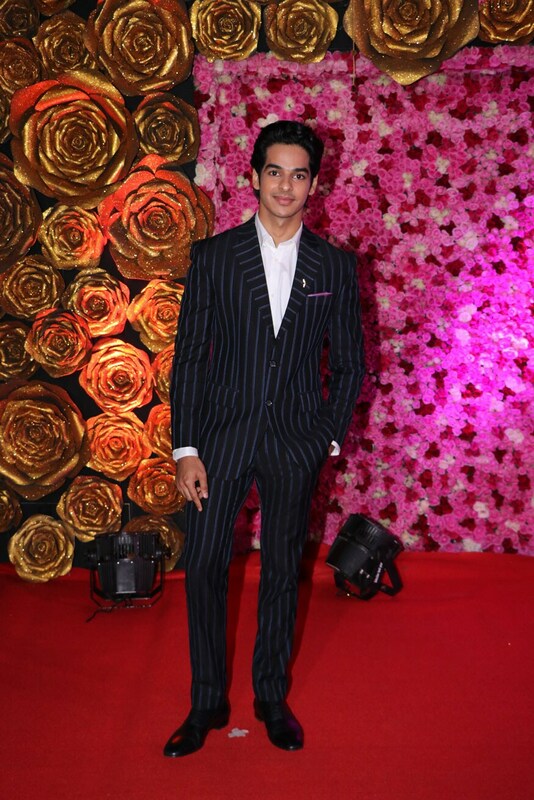 Dhadak actor Ishaan Khatter looked charming in a striped blue suit. He arrived at the event with his mother. The life of every party, Karan Johar has revamped his wardrobe and how! 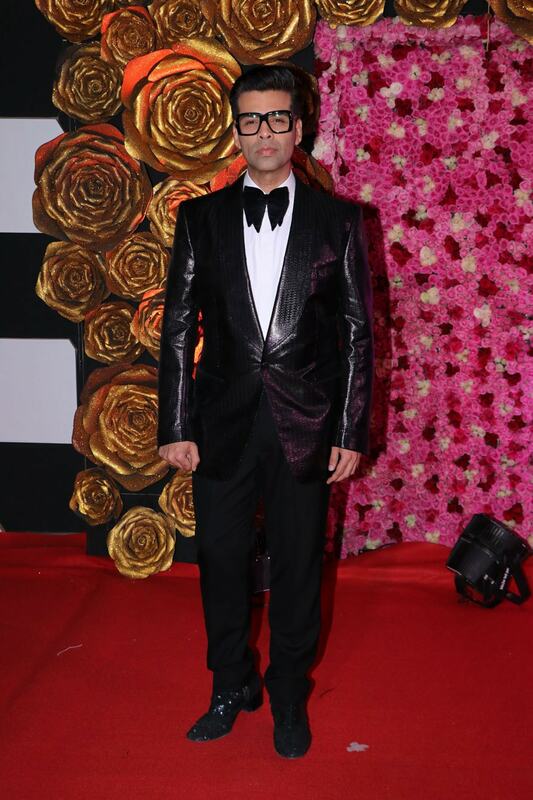 In a metallic black tuxedo by Tomford, Karan looked nothing but suave.